Condition Notes: Good condition, with dust jacket. 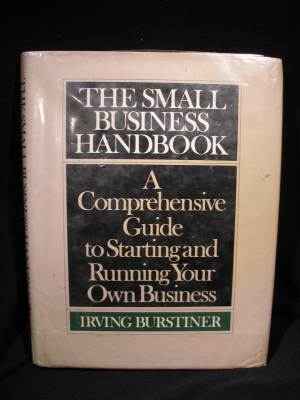 It is a great reference manual for businesses. Irving Burstiner is Associate Professor of Marketing at Baruch College, City University of New York. He is a management and sales consultant and has had extensive top level industry experience. The Small Business Handbook Each year, more that one-third of a million Americans, following an American tradition and chasing the great American dream, open their own small business. Unfortunately, nearly an equal number must annually close up shop, usually falling victim to mismanagement. If you are considering starting a small business of your own or have already embarked upon such a venture, The Small Business Handbook offers you a complete introduction to business administration. Packed with useful information, this practical guide will help you choose the right business, successfully launch it, help it grow in size as well as profits, and protect it. You'll discover how to finance your business, find a good location, and attract customers. You'll learn about product, price, and financial management, marketing and sales, and hiring and leadership techniques. In addition, you'll find valuable legal and tax pointers, plus dozens of tips for improving sales. Whether you're operating a manufacturing, wholesale, retail, or service business, this boo can help you avoid the common "start-up" problems and turn your business into a lasting financial success. Thanks for looking and buy with confidence!